The Pittsburgh Steelers have now hosted nineteen of their thirty allowed pre-draft visits; the latest Arizona State wide receiver Jaelen Strong. Strong is the fourth wide receiver the Steelers have hosted in the past two weeks, making it appear that the team is interested in finding depth at the position via the NFL Draft. They could use a slot receiver that is effective in the redzone. Strong was named first-team All-Pac 12 and a Fred Blietnikoff Award semifinalist following his redshirt junior year with the Sun Devils. At six-foot-two, 217 pounds, Strong has been compared in draft profiles with Sammie Coates, another prospect the Steelers have brought in for a visit. At the NFL Scouting Combine earlier this year, Strong posted a 4.44 second 40-yard dash time and a top performance 42.0 inch vertical leap. His broad jump went for 123.0 inches. At his Pro Day, Strong posted a 4.19 (seconds) 20-yard shuttle and 7.33 (seconds) three-cone drill. In 2014, Strong started in 12 games at the receiver position. In 2013, Strong was a second-team All-Pac 12 nominee and played in all 14 games with 13 starts. Strong transferred to Arizona State from Pierce College where he recorded 67 receptions for 1,263 yards and 15 touchdowns in ten games. NFL scouts have given Strong a high grade for the balance in height, weight and arm length. The former high school basketball and football player is known to adjust routes and return to the ball from the top of the route as necessary. Strong has proven he is comfortable in the slot and has soft hands that allows him to make catches even when being contested. Strong had the ability to get vertical but isn’t afraid to secure a low throw. 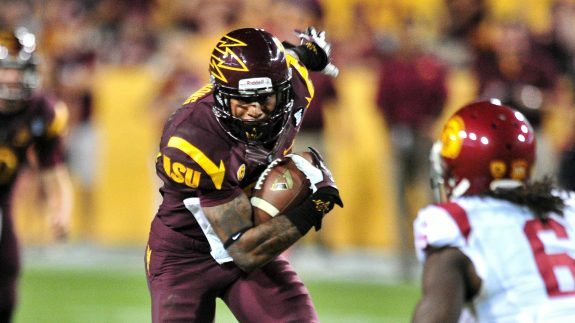 Arizona State utilized his ability on hitches, bubble screens and shallow crossing routes. 2 Comments on "Steelers hosted Arizona State Wide Receiver Jaelen Strong on Friday"
This kid would be a fantastic grab in the draft. The Steelers need a slot receiver so they can let Wheaton and Bryant get out on deeper routes. If we can’t get a TE in the end zone when in the red zone, then get a slick slot receiver. Lance Moore couldn’t do it. Time to build this team. Strong is projected as a possession receiver because he is relatively slow and has trouble getting separation. If A. Brown holds out (see the lead article above), the Steelers may consider drafting a receiver, but can probably find a good one in the late rounds of the draft or in free agency. I would be surprised to see the Steelers take a receiver in the top three picks, and Strong will be gone by then. Colbert and Co. have a knack for drafting superb receivers that others have overlooked (such as Brown himself and Nate Washington) and for finding gems in free agency. They can do it again if the need arises.